I was born in December 1976 in Jackson, Mississippi, to David and Kathy Smith. Shortly after birth, I was diagnosed with retinoblastoma, a form of eye cancer caused by a genetic defect. I became a patient at the St. Jude Children’s Research Hospital in Memphis, Tennessee, where I underwent radiation and chemotherapy treatments. Despite the numerous out-of-state trips for treatments by exceptional doctors and nurses, and the removal of the cancer itself, I eventually lost my eyesight completely around the age of five. Thankfully, I retained a vivid memory of shapes and colors. Despite my vision loss, I experienced a typical childhood, with boundless energy and imagination, and an extremely supportive family. My imagination often turned toward the futuristic–I could turn a corner of any room into a spaceship or an alien planet. Along with Barbie dolls and stuffed animals, my toy collection included Pac-Man, Star Wars, Transformers, etc. I was enrolled at the Mississippi School for the Blind, where I graduated valedictorian in 1994. Besides academic studies, I participated in the school choir, took piano lessons, played clarinet and trumpet in the band and was active in both the track and cheerleading teams. Over the years, I developed a wide range of interests–music, theater, technology, science and science fiction, and of course space. In 1986, I distinctly remember the Challenger tragedy. Many of us gathered into the science classroom where we listened to the news broadcasts on television. Even so, one of my dreams was to become an astronaut. I was probably one of the only students at MSB at that time who regularly checked out Braille science and space-related texts from the school library just for my own enjoyment. One text I recall was entitled “A Short Glossary of Space Terminology.” How antiquated its definition of a “computer” would seem today. With my interest in theater, I often dragged my schoolmates into performing in little humorous sci-fi sketches I wrote and directed for our annual talent shows. Without the Internet and the Worldwide Web during grade school, it was difficult to explore career possibilities for individuals who were blind. Most of the blind professionals that we students had exposure to worked in the fields of education, vocational rehabilitation services, vending or factory work, none of which struck a chord with me. After graduating, I attended Hinds Community College, where I obtained an Associate’s Degree in 1997. While there, I took various theater-related courses. I soon realized that, though I enjoyed acting classes immensely, the chances were slim of being able to pursue a sustainable career in that field. After graduating from Hinds, I attended Mississippi State University, earning a bachelor of business administration in information systems in 2001. During that time I became very interested in the concepts of information technology and Web accessibility since it was clear that both would be vital to whatever career I chose to pursue. During a course in Internet marketing, our class discussed the various factors that made for a successful Web site. I began noting some of the things I personally found key to making a Web site accessible. As I did some research on the Internet, I was thrilled to find that I was on track with professions in the field of Web accessibility. In the spring of 2001, I had the opportunity to apply to the EntryPoint internship program offered through the American Association for the Advancement of Science, or AAAS. As a business major, my application would be shared with various private sector companies. When I learned NASA was an option for engineering students, I mustered up the courage to ask the interviewer if business majors could also apply there. I wasn’t equipped to become an astronaut with my educational background and the program’s qualifications, but the thought of working at NASA indeed struck a chord with me. The interviewer said I could definitely apply at NASA, as many backgrounds were sought after, not just engineering. Early one morning, a couple months later, I awoke to a phone call from Laureen Summers with AAAS, who informed me I had been accepted for a summer internship at NASA Headquarters. Fearing that this was just too good to be true, I asked if perhaps they’d mistaken me for someone else–Mrs. Summers assured me they hadn’t. I had the privilege of working at NASA HQ in the Office of Spaceflight. During that time, my internship mentor, as well as the HQ webmaster, made me aware of the enactment of Section 508 of the Rehabilitation Act, requiring federal agencies’ electronic and information technology to be accessible to users of assistive technology, both employees and members of the public. Throughout my last semester at MSU, and the following few months, I kept in touch with NASA HQ and Goddard contacts I’d made during my internship. At college career fairs, I submitted my resume to several companies, and even NASA’s Stennis Space Center, but received no positive leads. In the spring of 2002, however, I was offered a job as an information technology specialist at Goddard, in what is now the Enterprise Solutions Division of the Information Technology and Communications Directorate (ITCD). In late May of that year, I packed up all my worldly belongings into a moving truck, and my mother and stepfather drove me from Byram, Mississippi, to Greenbelt, Maryland. There, I settled into an apartment where I’d live on my own for the first time, and began my new job on June 3. It still amazes me that I was able to pick up and move to a city much bigger than where I’d grown up, where I’d only visited briefly, to live alone, to begin my first full-time job. During my time at Goddard, I have worked to ensure that Web sites and Web applications my organization develops are compliant with Section 508, and I served as backup to the Goddard Section 508 Coordinator. As of May 2014, I serve as Goddard’s NOMAD Postmaster, where I act as a center liaison for the agency’s email, calendaring, and messaging solutions. I also served on the center’s advisory committee for people with disabilities (later named the Equal Accessibility Advisory Committee), the ITCD Diversity and Inclusion Committee, and the Goddard Employees Welfare Association GEWA Council. One of the greatest things that happened to me was in June 2007 when I married Scott Ritz, a Goddard contractor I originally met in 2003 while performing in a Goddard Music and Drama (MAD) production of Barnum. Outside of work, I pursue several hobbies with my husband. We continue to participate in MAD, performing on stage and working behind the scenes. We enjoy attending sci-fi and especially Star Trek conventions. We are both active in our church. And we serve in the Civil Air Patrol, where I currently hold the rank of first lieutenant, currently serving as communications officer for the Bowie Composite Squadron. We enjoy attending concerts in a wide range of musical styles, especially those that feature synthesizers. We have made more than one visit to the factory in Ashville, North Carolina, where Moog synthesizers are made. In 2014, I became the very proud owner of a Moog Sub-Phatty synth, a limited number of which will be made with Braille labels for the controls. Also, for more than a decade I attended Adult Space Camp at the U.S. Space and Rocket Center in Huntsville, Alabama, thanks to accessible materials through a Space Camp program for visually impaired students called SCIVIS. One of my favorite things at Space Camp is performing spacewalks during our simulated shuttle missions. I’m extremely thankful to my family, especially my parents and grandparents, who supported me as I pursued my dreams, professional and otherwise. I’m also thankful to all of my teachers throughout the years and to my colleagues. If I could pass along any advice to the next generation, it would be this: Never be afraid to follow your dreams, even if they take you in directions that others around you haven’t gone. And no matter what career you choose to pursue, always stay alert to opportunities to incorporate your dreams. Although I wasn’t able to be an astronaut or an actor, my path led me to NASA. Here, I have been able to pursue a rewarding career, and participate in theatrical productions along with others in my NASA family. I even met my husband here. I’ve gotten to live my dreams of being an astronaut at Space Camp, once even as commander of the Enterprise Orbiter. Courtney Ritz began working as a NASA Headquarters intern in 2001 in the Office of Spaceflight. This experience inspired her to pursue a career with NASA. She became a fulltime employee at the Goddard Space Flight Center in 2002, supporting the organization that is now the Information Technology and Communications Directorate. 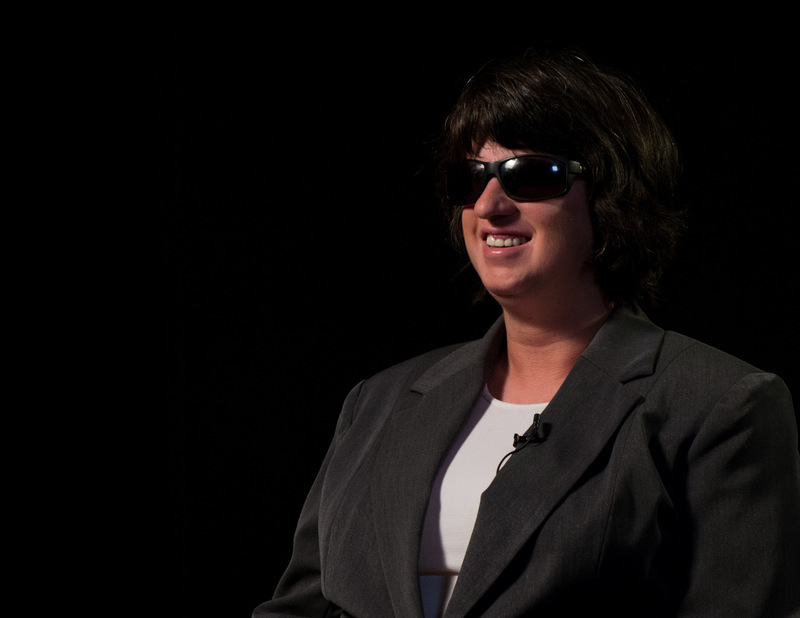 As a Web Accessibility Coordinator, she has used her technical skills and experience as an individual who is blind and who uses assistive technology. She actively promotes accessibility awareness to Goddard’s IT services community and helps to ensure that the IT products and services are accessible to people with disabilities. More recently, she has broadened her responsibilities, by serving as Goddard’s primary point-of-contact for the Agency email, calendaring, and messaging services. In addition, Courtney has been active in Goddard’s Diversity and Inclusion efforts. Over the years, she has served on various Center-wide and organization-level Diversity committees. She has also served as a member of the Goddard Employees Welfare Association (GEWA) Council, as Chair of the Clubs Committee. This GEWA role requires acting as a liaison between the Council and over 45 employee clubs. Courtney has been able to pursue her interest in theater by participating in one of these GEWA clubs, the Goddard Music and Drama Club (MAD). She has performed in several stage productions, and met her husband, Scott, participating in MAD. A life-long space enthusiast, Courtney has been able to live her dream of being an astronaut, by attending Space Camp more than 10 times since 2002.